So as some of you will know I have been working on a number of programming projects over the last few years. Admittedly some are better than others – but the one thing that has always bothered me is how I can provide a better setup and configuration experience for my readers. Most of my tools are pretty simple in terms of their installation – however there are a few which I have authored that have required a more involved setup process – usually I have handled this through user guides with step by step screen shots – or videos that I have published via my YouTube channel. The ideal scenario would be for me to deploy my software via MSI using tools such as Install Shield, Install Aware – or my personal favourite – Advanced Installer. Creating Application Pools in IIS. Creating Virtual Directories in IIS. 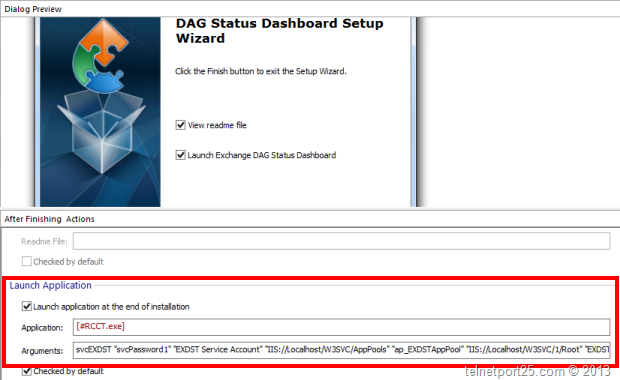 Creating Service Account in Active Directory. However the above tends to be contained within the higher level “paid” versions which tend to be very expensive (for a single ad-hoc amateur developer like myself). So with the above in mind, I decided to write a simple and small tool (which is probably of more interest to developers, rather than Exchange folks) which when combined with a purpose built setup tool (more on this below) – automates the creation and modification of the above. Advanced Installer has a completely free edition which allows for a process to be launched post install with Parameters (why I like this will become apparent very soon). Advanced Installer is very easy to use. Other main tools (such as Install Shield or Install Aware) whilst being exceptionally powerful – do not offer a free version for non-profit use. By combining the RCCT tool with Advanced Installer – I can package my software up into an MSI – and then execute a program at the end of the install with a number of parameters which gives me the following functionality of the “paid for” version. Basic IIS Configuration (creating Application Pools, Virtual Directories, assigning Virtual Directories to Application Pools). Creation of Accounts and modifying group membership in AD. You can also use the RCCT as a stand alone command line tool. 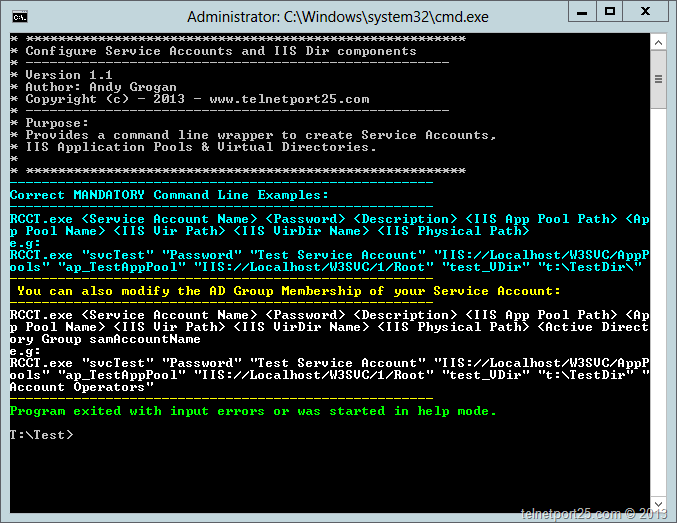 Create a user calls “svc_Test” in Active Directory. Set the password to “Password1”. Set the description on the AD account to “Demo Service Account” . 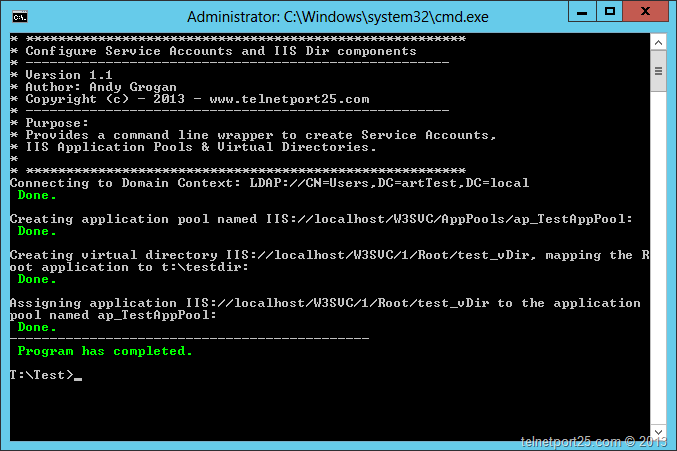 Create an Application Pool called “ap_TestAppPool” within IIS. 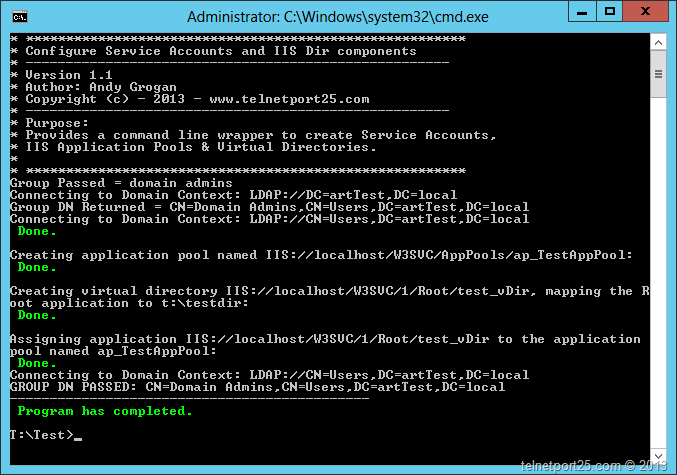 Create a virtual directory called “test_VDir” within the first website (determined by the IIS path provided) give it a physical path of “T:\testDir” and then assign the “ap_TestAppPool” to the virtual directory (making it an application). RCCT.exe "svc_Test" "Password1" "Demo Service Account" "IIS://Localhost/W3SVC/AppPools" "ap_TestAppPool" "IIS://Localhost/W3SVC/1/Root" "test_vDir" "t:\TestDir"
Sets the default page to “default.aspx”. Sets the default Security to NTLM. These options are not configurable in this version. Naturally I make use of the free version. You can use the RCCT in conjunction with the [ Exit dialog –> After Finishing Actions –>Launch Application ] options – see below. I hope that someone out there finds this useful – and I welcome any feedback or suggestions.